Every great golfer knows that investing in a quality rangefinder is a great way of shaving off a few strokes off your game and earning some bragging rights over your golfing peers. After all, to hit your target you have to know exactly how far it is from you, right? Not only do rangefinders offer the distance to the flag with detailed accuracy, they are also able to pick the flag from any trees and bushes on the course, helping you take out the guessing from your shots. There is a wide range of choice when it comes to choosing rangefinders. They come at different prices and offer varying features. It is therefore important to do a bit of research before settling on a particular rangefinder. 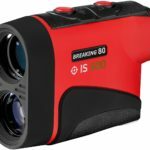 To help you make the best choice based on your needs, we did the research on your behalf and came up with a list of the 10 best golf rangefinders available on the market. 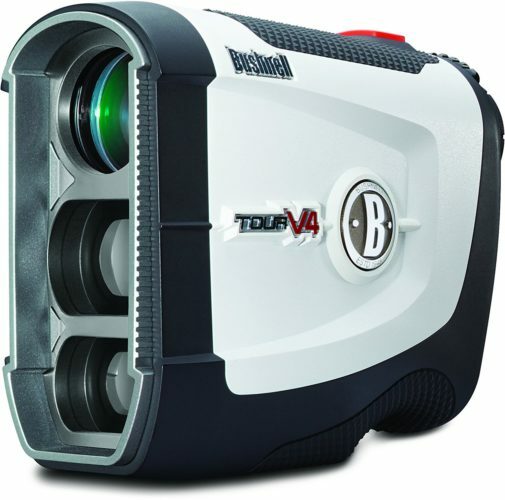 Made by Bushnell, an established name in the rangefinder industry, the V4 is an improvement of the older Bushnell Tour V3 laser rangefinder, with a new ergonomic design which packs a great set of features into a compact form factor. Like most rangefinders on the market, it is optimized for single hand operation, with HD optics featuring 5x magnification and a 24mm objective lens. One of the key features of the V4 is the award-winning Pinseeker, which incorporates JOLT technology. With the JOLT technology, the V4 delivers a short burst of vibration when it locks onto the flag. This gets rid of any doubt and ensures you get the exact measurement you want. 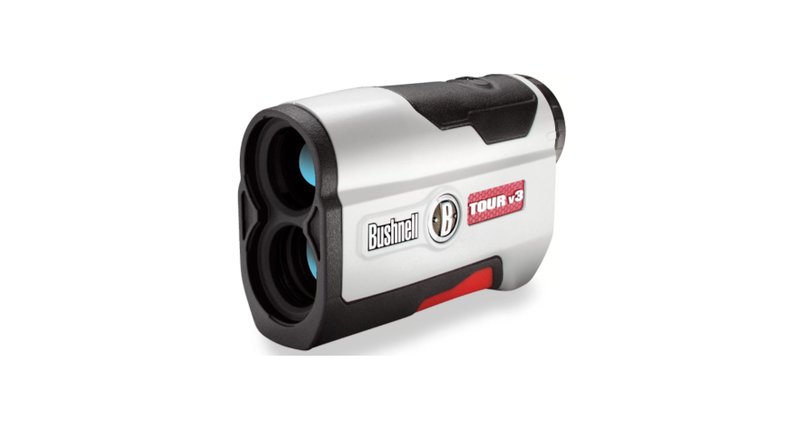 The Bushnell Tour V4 came as the long-awaited replacement to the Tour V3. It is a very popular among amateur golfers in the United States. The Tour V4 is 30 percent lighter and smaller than its predecessor. The size reduction means it fits perfectly in the hand. It also means that you can easily and comfortably carry it in your pocket. It has an improved ergonomic design which makes it easy and comfortable to use. It has one button which controls everything, from shooting the laser to switching between modes. This button and the focus adjustment ring are positioned in such a way that you can use the same finger to fire the laser and adjust the focus. Along the bottom of the device is a small crevice where you can rest your thumb. Just like its predecessor, it has textured top and bottom areas to ensure a better grip. This rangefinder also has a water-resistant body. While it cannot endure submerged conditions, you can use it in slightly rainy conditions without the risk that it will get damaged. The Tour V4 comes in two editions. The standard edition and the slope edition. In addition to the features on the standard version, the slope edition is able to measure the elevation change between the player’s position and the position of the pin. It gives an adjusted yardage depending on the angle of elevation. Many players find this to be very useful since it helps with club selection. Initially, slope edition rangefinders were not allowed in golf tournaments. However, after Rule 14-3 regarding artificial devices was repealed, players can use slope edition rangefinders in tournaments as long as they keep the feature turned off. Players can use the slope feature to improve their game during practice rounds. With this in mind, it is more advisable to purchase the slope edition. To distinguish between the standard and the slope edition, the slope edition is fitted with a red trim at the front. Not only does the Tour V4 help you tell distances to objects, it also magnifies objects, giving you a clear view of your target. The V4 is capable of up to 5x magnification. You can zoom onto far away targets for a better view. The Tour V4 also comes with an improved focus mechanism which ensures a much clearer image. Instead of having to rotate the eyepiece to adjust focus like with the Tour V3, the V4 comes has a single slide focus ring above the eyepiece, which you can easily rotate with your index finger to adjust the focus. However, the slider ring is a slightly stiffer that we would have liked. The Tour V4 has a range of 5-1000 yards and can scan the area within 400 yards of the flag. Accuracy on the Tour V4 is an impressive plus or minus 1 yard. The V4 features continuous scan mode, which keeps the measurements continuously updated on the LCD display as you pan the rangefinder across the golf course. Just like the VPRO500, it has an accuracy of +/- 1 yard, making it very dependable. One version comes with Bushnell’s patented Slope Technology, which adjusts the measurement to the flag depending on the slope, giving more accurate measurements. In spite of this, it is still tournament legal, since you can switch off the slope function during tournaments. It also uses Class 1 laser with an average output of 0.5mW. The V4 comes with a premium all weather carrying case, a 3-volt battery, and a 2-year warranty. Nikon is a company that has built a name for itself as an industry leader when it comes to the manufacture of various optical and imaging products. With this in mind, you can expect that high quality and precision from any of their offerings. 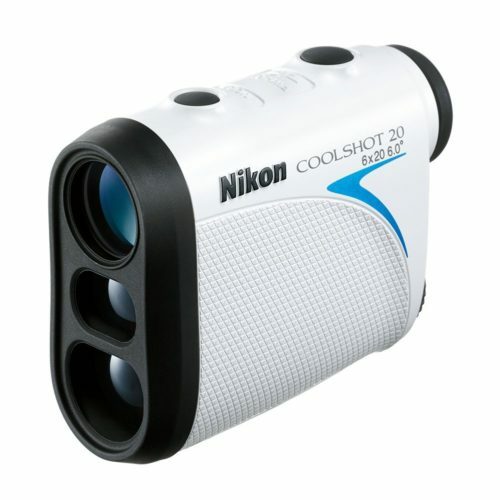 The Nikon Coolshot 40 is the most powerful rangefinder in Nikon’s range of USGA approved measuring devices. It came as an upgrade to the wildly successful Nikon Coolshot 20. The Coolshot 40 is a compact, affordable and fully weatherproof rangefinder that is specifically made for the golf course. One of the unique features on the Coolshot 40 is the First Target Priority Mode with HYPER READ Technology. This is Nikon’s intuitive technology that allows the Coolshot 40 to display instantaneous readings regardless of the distance from the object. If you are wondering just how fast we are talking, the Coolshot 40 will display the yardage in less than half a second after you fire the laser. The rangefinder has a range of 650 yards and 450 yards to the flag. With the HYPER READ technology, it means that you will get the distance for a target at 600 yards just as fast as you would for a target that is at 100 yards. Apart from the First Target Priority Mode, the rangefinder also has an 8-second Continuous Scan Mode that is very useful when you want to know the yardage of several objects at a go. Again, Nikon made another improvement here. With the Coolshot 20, to use the continuous scanning mode you had to push the power button, then push it again and hold it down to activate this mode. From there, you had to keep it held down for the entire 8 seconds. Using the Continuous Scan Mode is a lot easier on the Coolshot 40. You only have to turn the device on and then press and release the laser button to activate the continuous scanning mode. While this might seem like a small upgrade, keeping the laser button held for 8 seconds over several rounds of play will leave your finger fatigued, which might, in turn, affect your shot. The Nikon Coolshot 40 has a compact design, measuring 4.4 x 1.4 x 2.8 inches and weighing only 5.6 ounces. While there are some lighter devices on the market, the Coolshot 40 cannot really be considered as heavy. You can easily carry it with you around the golf course. The rangefinder uses high-grade plastic for the casing, thereby allowing it to keep the weight down and maintain its buoyant feel without compromising on the device’s strength and sturdiness. This ensures that the Coolshot 40 keeps up with its metal encased rivals. On top of that, it comes with an intuitive LCD display that displays the yardage and crosshairs in a red hue instead of the usual black display. This makes it easier to see the readings in varying light conditions. This is a feature that is mostly found on premium rangefinders. We were surprised to find it on a budget rangefinder. Kudos Nikon! The Nikon 40 is fairly accurate, with readings that are up to plus or minus 0.75 yards of the actual reading. This is again much better than most rangefinders which have a plus or minus 1-yard accuracy. The device offers the choice of displaying the readings either in meters or yards, allowing you to choose the units you are most conversant with. It is fitted with a 22 mm objective lens that is capable of up to 6X magnification. The Nikon 40 does not have slope functionality, which makes it perfectly legal for use in all golf tournaments. 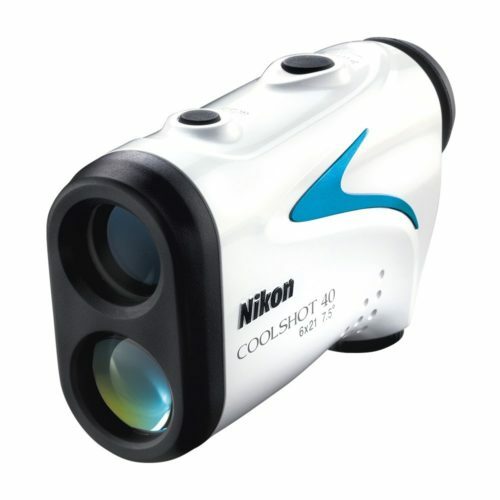 If you want a device with slope edition, you can go for the Nikon Coolshot 40i, which is similar to the Coolshot 40 but with slope functionality included. All in all, the Nikon Coolshot 40 is a great laser rangefinder. It is a mid-level rangefinder that packs some advanced technology and simplicity of design and use to come up with a smooth, highly intuitive device. While it is yet to gain popularity like some more advanced models, it is slowly converting golfers to its stable. With the affordable price and the user-friendliness, you cannot go wrong with the Nikon Coolshot 40. 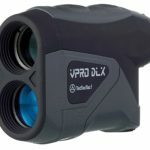 The VPRO DLX is the latest premium rangefinder from TecTecTec. It has a long measurement range of up to 600 yards and an accuracy of +/-1 yard, with an ultra-accurate Pinsensor technology that allows it to measure distances to overlapping objects. The Pinseeker on the VPRO DLX is more sensitive than you will find in other rangefinders. It has a multilayer coating and 6x magnification monocular lens which provides bright, vivid images. The VPRO DLX is encased in a waterproof body, allowing it to be used even on rainy days. It has a long lasting CR2 battery and uses eye-safe rangefinder Class 1 laser, which has an average power output of less than 0.5mW. It comes with a premium carrying bag, a microfiber cleaning cloth, and a 1-year TecTecTec warranty. 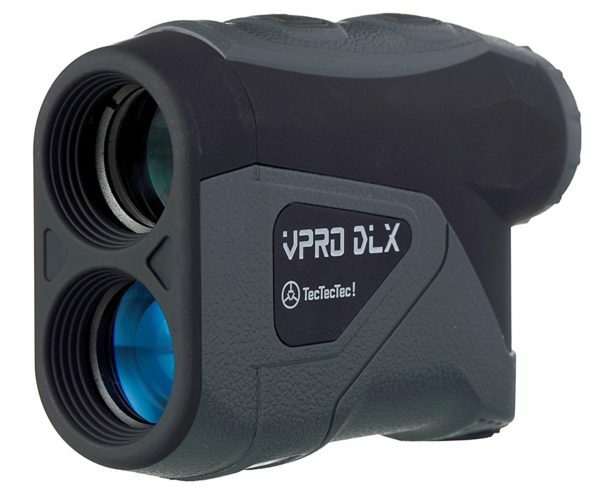 When it comes to range, the VPRO DLX is a high accuracy, long distance rangefinder. According to TecTecTec, it can measure up to 600 yards with plus or minus one-yard accuracy and up to 900 yards for reflective targets. This is something we were able to test and confirm. However, this will be determined by the weather of the day. In clear weather, the device will give accurate yardages to targets beyond the 600-yard range. However, this range will decrease in foggy or rainy weather. The flag seeker on the VPRO DLX is one feature that impressed us. With some rangefinders we have tested, we have had discovered there was a problem with obtaining the pin accurately. The problem becomes worse when there are objects in the background. With the TecTecTec VPRO DLX, you will not experience any such issues. You can easily get the yardage to a flag even when it is surrounded by trees or bushes. Combine this with the excellent magnification and you can bet that you have an excellent device on your hands. Optics are one of the most important things to consider when it comes to choosing a rangefinder. Ideally, you should go for a device with the best clarity and accuracy. The VPRO DLX offers great clarity and accuracy. It also has a perfect through the lens display which comes in handy when using the rangefinder in continuous scanning mode. The optics on the TecTecTec VPRO DLX are some of the best you are going to find on the market. Another important factor to consider when purchasing a golf rangefinder is its weather resistance. Being out on the course with a device that is not weather resistant puts it at risk of getting damaged. The VPRO DLX has a water-resistant design which means that it can be used in rainy conditions without any effect on its performance or durability. However, the device is not totally waterproof, which means that you should probably not expose it to submersion conditions. The TecTecTec’s VPRO DLX comes with three different scanning modes. The first one is the Pin seeker mode. This mode allows the device to single out the flag even when it is surrounded by a group of distractions. The Pin seeker is highly accurate and gives you the confidence that you are getting the actual distance to the pin, not any other nearby objects. The second mode is the First Target Priority mode. This mode works by showing the distance of the closest subject when there is a group of objects. This mode is especially helpful when measuring the distance to a golf flag when there are wooded greens in the background. The third mode is the continuous scanning mode, which allows you to scan across the course, with the device giving you continuous updates of the distances to different targets on the course. The VPRO DLX has a solid battery that keeps the device powered for more than six hours when fully charged. This means that a fully charged battery will be enough for a complete game of golf. It’s good to note that the VPRO DLX does not have a slope edition, which makes it legal for use in all tournaments. The Pro X2 is the ultimate rangefinder from Bushnell, packing all of Bushnell’s industry-leading innovations. It has slope compensation which allows it to calculate and adjust measurements depending on the degree of incline or decline. It also has slope-switch technology, which makes it possible to disable the slope function to make the device tournament legal. To toggle between standard and sloped modes, Bushnell uses an innovative technology where you simply need to move the Pro X2 logo up or down. The Pro X2 features Bushnell’s patented Pinseeker with JOLT technology, giving you tactile feedback when you lock onto the flag. It uses 2nd gen E.S.P (Extreme Speed Precision) and fast focus for superfast measurements and comes with 6x magnification. Just like with the other rangefinders from Bushnell, using the Pro X2 is a breeze. To get the yardage to a target, you simply need to point the rangefinder towards your target, look through the eyepiece and hold down the power button. Within a split second, the device will display the distance to your target. The Pro X2 also comes with Dual Display Technology (DDT). If you want to use the dual display function all you have to do is press the Bushnell logo at the unit’s side. This allows you to toggle between the black and red graphics displays to find one that will best suit your lighting conditions. If you are trying to view something that is far out of the course, you can use the Pro X2’s 6X magnification to bring it into focus. The magnification is controlled using the dial on the eyepiece. The battery use is very efficient, capable of providing juice for your device for several hours of gameplay. However, it is prudent to have an extra battery just in case. The Pro X also has Bushnell’s JOLT enabled pin seeker, which gives you the confidence that you are actually measuring the distance to the flag and not any other object. When the device locks on the flag, it gives a short vibration to notify you that has the flag in its focus. However, it will not vibrate when it locks on any other object. We found this to be a very useful feature. According to Bushnell, the Pro X2 has an accuracy of plus or minus half a yard at a range of between five and 1300 yards, with an accuracy of +/-0.5 yards. This is a very impressive range, one of the best you will find on the market. Initially, we thought this might be an exaggeration on Bushnell’s part and decided to try it out. The results we received were simply amazing. The accuracy was almost on point. We tried getting the distance to a target across the course at approximately 1,000 yards away and we got a reading! While you are hardly going to come across any golf holes that far away, the rangefinder promises to give the correct distance if you come across one. When you switch on the slope technology, it gives readings that are adjusted to reflect the change in elevation between the payer and the flag. The Bushnell Pro X2 uses Class 1 laser and is encased in an IPX7 waterproof rubber armored metal housing. While it costs a premium price, you can rest assured that its high-level performance makes it worth every penny. This makes it more of a professional rangefinder, since amateur golfers may not be willing to spend so much on a rangefinder. Like most Bushnell products, it comes with a 2-year limited warranty. The TecTecTec VPRO500 is a budget laser rangefinder that is capable of measuring distances of up to 540 yards with, with 6x magnification and 1-yard accuracy. It uses eye-safe rangefinder Class 1 laser, which has an average power output of 0.5mW. A recent entry into the scene, it comes with the latest technology, making it one of the most accurate and flexible golf measuring devices. The VPRO500 features Pinsensor technology, which allows it to isolate different targets. For instance, with Pinsensor technology, it can isolate the flag from any trees that might be behind it. It comes with a high-quality through-the-lens display which provides ultra-clear and multi-layered optics that make it very easy to read the distance measurements and battery information. When looking for a rangefinder, the optics are one of the most important aspects you should consider. The TecTecTec VPRO 500 comes with a 24-millimeter objective lens that enables it to display ultra-clear images of your target. Like noted above, the optics are multi-layered for optimal performance and minimal light reflection. In addition to showing the distance, the VPRO 500 also has a battery meter that is shown in the HUD display, thereby keeping you aware of the remaining battery power at all times. It also comes with diopter adjustment functionality, which allows you to adjust the optics to compensate for nearsightedness or farsightedness. Accuracy is another important factor to consider when shopping for a golf rangefinder. The TecTecTec VPRO 500 has a range of 5 to 540 yards. While this is not as impressive as some other devices like the offerings from Bushnell, it is still sufficient for most golfing applications. The VPRO 500 is capable of up to 6X magnification, which allows you to have a clear and detailed view of the whole course. However, the clarity of the images was not very impressive when we tested the device in foggy weather. Design-wise, the TecTecTec VPRO 500 is a great device. The VPRO500 is both lightweight and portable, making it a convenient golfing companion. The device measures 104 by 72 by 41 millimeters and weighs just under 200 grams. This allows you to easily slip it into a pocket as you move around the course. With its lightweight, you will hardly feel it bogging you down. The VPRO 500 incorporates an ergonomic design that feels comfortable in the hand and also comes with a durable housing that is capable of handling a few knocks and drops. The rangefinder is rainproof, so there’s no reason for you to fret in case some rain catches you out in the course. Apart from its well-designed housing, the VPRO 500 also comes with a shock resistant premium carrying case, a wrist strap for easy carrying and a microfiber cleaning cloth. The VPRO 500 comes equipped with three scanning modes. You can easily switch between these three modes using the mode button. The first mode is the First Target Priority Mode. In this mode, the VPRO 500 will provide you with the measurement to the first object in a group of objects. This is especially useful when the flag is in front of a cluster of trees. The second mode is the Continuous Scanning Mode, which allows you to continuously scan across the course while it gives you updated yardages to every object that appears within your sight. This mode comes in handy when you need to check the distances to different hazards, which you will hopefully avoid. Finally, there is the Pinseeker mode, which searches for and locks on the flag. Unfortunately, the VPRO 500 does not give tactile feedback when it locks onto the target. The VPRO 500 does not have a slope edition, which makes it legal for use in all golf tournaments. All in all, the TecTecTec VPRO is a great device to have with you on the golf course. Combine this with its budget price and you can be sure that it won’t disappoint you. On top of this, it comes with a free CR2 battery, a 30-day money back guarantee and TecTecTec’s 2-year warranty. If you experience any issue with the device, you can also reach out to their friendly customer service staff for assistance. Bushnell is a popular brand that is known for quality and performance when it comes to rangefinders and other optical devices. 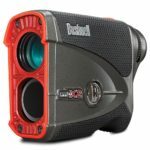 Bushnell continues to maintain their reputation with the Tour X model. It has many impressive features that you can expect from any offering from Bushnell. However, one of the unique features of the Tour X is the ability to interchange the faceplates. The interchangeable faceplates are used to disable or enable the elevation measurement function, making it tournament legal when you want to and switching to slope mode for practice rounds. With the black faceplate installed, the slope function is disabled, making the device tournament legal. The red faceplate, on the other hand, has a USB connector that activates slope mode, allowing the device to provide yardages that include compensation for the change in elevation between the player’s position and the pin. This information is important because it helps a player to determine the best club for the shot as well as how hard they need to hit the ball. To make sure that you do not confuse the faceplates and end up being disqualified from a tournament, the red faceplate has a “Does Not Conform” message on the front side. 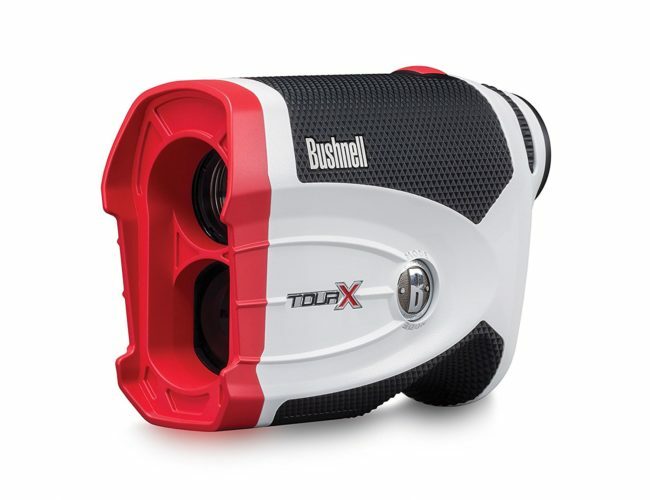 Like most other high-end offerings from Bushnell, the Tour X comes with Bushnell’s patented JOLT technology. With this technology, the device gives tactile feedback when you lock on the flag. You will feel a little vibration on the device, giving you the reassurance that you are accurately measuring the distance to the flag. It also comes with Dual Display Technology (DDT), which allows you to switch the display between red and black graphics displays based on the lighting conditions on the course as well as personal preference. You can easily switch between the two display modes using the Vivid Display sliding switch, which is located at the back of the device, below the viewfinder. The device has a small and compact design that will fit easily in the hand of an adult player. It has a robust casing that keeps the internal parts well protected. On top of that, it has a contoured rubber grip that gives you a non-slip grip while at the same time acting as a shock absorber in case you happen to drop your rangefinder. It also has a thumb space at the bottom which gives you a natural and comfortable hold. Sometimes it is the small things that matter. The case and the faceplates are well designed, giving the Tour X a premium look. To complete the look is Bushnell’s B logo on the side of the rangefinder. Like most offerings from Bushnell, the Tour X has an impressive range of 5 to 1300 yards or 450 yards to the flag. At 1300 yards, seeing objects can be a little difficult, which is why this bad boy is capable of up to 6X magnification with HD optics to ensure you can see your targets clearly. However, you need to have steady hands when getting measurements to long-range targets, since a small movement will result in a significant movement at 1300 yards. Long range objects are picked up with speed thanks to the Bushnell Extreme Speed Precision 2 (E.S.P.2) technology in the Tour X. The second generation of E.S.P is five times faster than its predecessor making the Tour X a very quick laser. Accuracy is quite high. The Bushnell Tour X provides yardages that are accurate to half a yard. 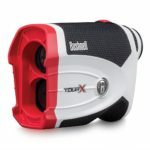 With the Tour X, Bushnell really pushed the envelope when it comes to the design and build of golf rangefinders. The faceplates are easily interchangeable and the Dual Display Technology is a welcome addition. The only disadvantage is that you might need to use the manual focus more frequently than you would with some other Bushnell models. While the price of the Tour X is a bit on the higher side, the accuracy, versatility and long range it provides justify the price. On top of that, Bushnell shows their trust in their products by offering a 2-year warranty for the Tour X laser rangefinder. SereneLife is a relatively new name in the rangefinder market. It does not have many products as other rangefinder manufacturers currently in the market. However, they still have a quality product known as Premium Slope rangefinder. It is a stylish rangefinder that comes bundled with all the features a golfer would need to get actionable and reliable data. The inclusion of slope and pinseeker technologies ensure a golfer has the best experience as they are playing. Being a newcomer to the golf rangefinder market, we decided to take it for a test and see for ourselves what the device has to offer. Right off the bat, you will notice that the SereneLife Premium Golf Laser Rangefinder is a modern looking device. At 4 x 1.6 x 2.9 inches and weighing a mere 0.4 pounds, this is one of the smallest and lightest golf rangefinders you are going to find in the market. The size means it will fit on most pockets without feeling uncomfortable. For aesthetic purposes and simplicity of use, the SereneLife Premium Golf Laser Rangefinder comes with only one button, which controls all its functionality. This makes it an easy device to use, even for first-time users of golf measuring devices. To take measurements, you simply need to take aim at your target, press the laser button and voila! The yardage will immediately appear on the device’s through-the-lens display. The rangefinder is made of Engineered Acrylonitrile Butadiene Styrene (ABS), which makes it quite sturdy and capable of handling a couple of drops and knocks. The Engineered ABS casing is also water resistant, which means it can be used in inclement weather. However, the manufacturer is very clear that it is not waterproof, so you should avoid subjecting it to submersion. The SereneLife Premium Golf Laser Rangefinder has a range of 5.5 to 546 yards, with an accuracy of plus or minus 1 yard. It maintains this accuracy regardless of the range of your target, which makes it quite a reliable measuring device. While this is not the most impressive range, it is sufficient for use in most courses. The device comes with a 24 mm implanted lens which is capable of up to 6X magnification, allowing you to zoom into and clearly see objects that are far down the course. The device also gives users the option of reading measurements in either yards or meters. To toggle between the two measurement units, simply hold down the power button for three seconds. 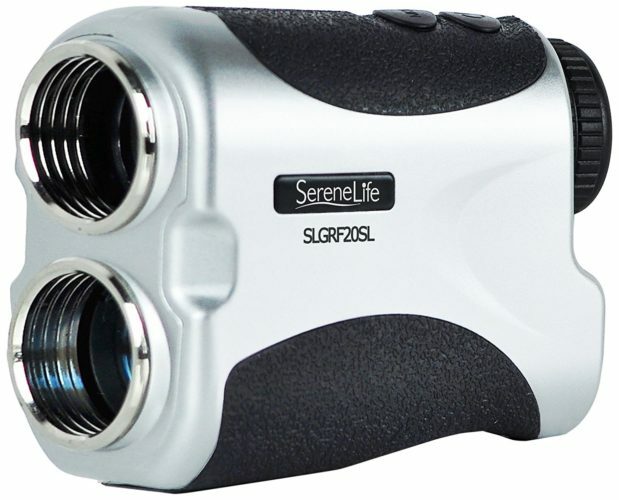 The SereneLife Premium Golf Laser Rangefinder also comes with Pin seeker technology, allowing users to locate the flag from a group of distractions. This feature is also useful in situations where you cannot see the flag with your naked eye. On top of that, the SereneLife Premium Golf Laser Rangefinder also comes equipped with slope functionality, which allows the device to show readings that include compensation for any change in elevation between the player and the flag. However, this means that this rangefinder is not legal for use in some golf tournaments. All the same, it is a great device to have in your golf bag for your practice rounds. The SereneLife Premium Golf Laser Rangefinder comes with a 3V CR2 battery and travel case, meaning you do not have to spend extra money to buy these items. While the battery life is not bad, there are other similar rangefinders that have a better battery life. 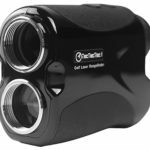 All in all, the SereneLife Premium Golf Laser Rangefinder is a great laser rangefinder that will help you shave off a couple shots off your game. 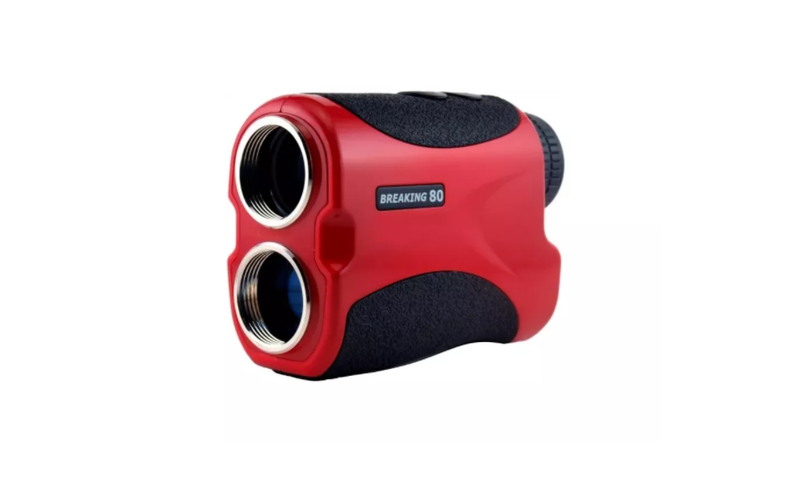 The best part is that it comes at half the price of what you will have to part with for similar rangefinders from famous brands. The SereneLife Premium Golf Laser Rangefinder also comes with a 1-year warranty. However, you need to register your device online for the warranty to be valid. The COOLSHOT 20 is a powerful USGA approved rangefinder. It has the speed, precision and optical quality of Nikon rangefinders, all of this fitted inside a compact and lightweight 4.4-ounce body. This allows it to easily fit into a golf bag or even a pocket. Its 6x magnification monocular uses Nikon’s legendary optical technology to deliver bright, crisp images. It has a range capability of up to 550 yards, with an accuracy of less than one yard. First Target Priority allows it to quickly and accurately isolate the flag from any background objects, while the 8-second continuous scan mode allows you to quickly measure the distance to multiple objects. One of the first things you will notice about the Nikon Coolshot 20 rangefinder its size, or rather the lack of it. 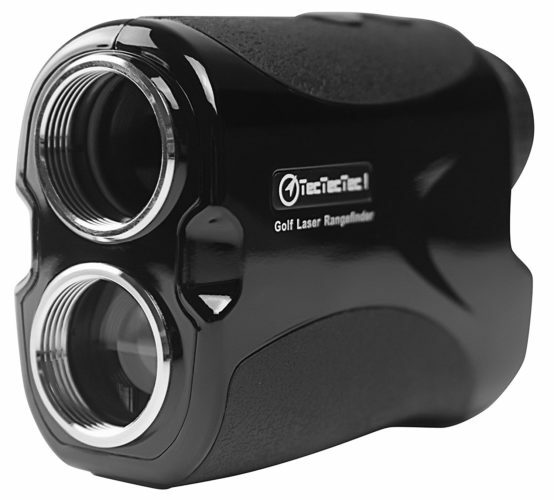 The Coolshot 20 is ranked as one of the smallest laser rangefinders in the market at just 9 centimes by 7 centimeters. It is also 55 grams lighter and 2 centimeters shorter than other Nikon products. The main advantage of it size is the ability to easily slip into a jacket or trouser pocket. This means that you do not have to waste time reaching into your bag every now and then. The Nikon Coolshot 20 has an 8-second continuous measurement feature. By pushing and holding the power button, you can pan across the course and continuously make measurements for up eight seconds. You will find this feature very useful when looking for measurements of thin or very small or multiple objects. For instance, you can get the measurements to the hazard, scan across the course and get the distance to the flag and then focus on the trees behind the flag. All this with one press of the power button. Despite its small size, the Coolshot 20 has impressive accuracy. According to Nikon, the Coolshot 20 has a range of 6 to 650 yards which change in one-yard increments. It has 6X magnification which ensures that you can see everything clearly, even if the target is far away. The high precision on the Coolshot 20 means that you will know the exact distance to different objects on the course. We found it to be quite accurate even though we had doubts due to its small size. The Nikon Coolshot 20 is also equipped with a great feature known as First Target Priority. This feature allows the rangefinder to focus on the first target in your line of sight, ignoring the other objects in the background. The feature will then provide you with precise distance reading of this target. The Coolshot 20 will do this even when the background objects are very close to the target. We found this to be a great feature especially when we tried to detect a flagstick in front of obstacles such as trees. The compact size and ergonomic shape result in a comfortable user experience. When we tried it, we found that it was quite easy to handle and move around with on the course. It comes with a carry case fitted with a clip, giving you the option of either attaching it to your belt or carrying it in your pocket. Measuring the exact yardage to a target can be done with the touch of a button. To get the distance you simply point the gadget to the target and push the power button. Within a few seconds, the device will give you an accurate yardage to your target. If you wish to switch the measurement units between meters and yards, there is a mode button at the front of the gadget that changes these settings. This gives you the flexibility of using whatever measurement units you are comfortable with. To ensure you do not run of power, the Coolshot 20 has an auto shutdown feature which allows it to turn itself off after ten seconds of inactivity. It also has a battery status notification so you are always aware of the amount of power remaining. The COOLSHOT 20 is rainproof and has a wide temperature tolerance, making it suitable for use even during inclement weather. It uses Class 1 laser with a power output of less than .0975mW. If you are looking for a versatile and compact device to help improve your game, you won’t go wrong with the Nikon Coolshot 20. 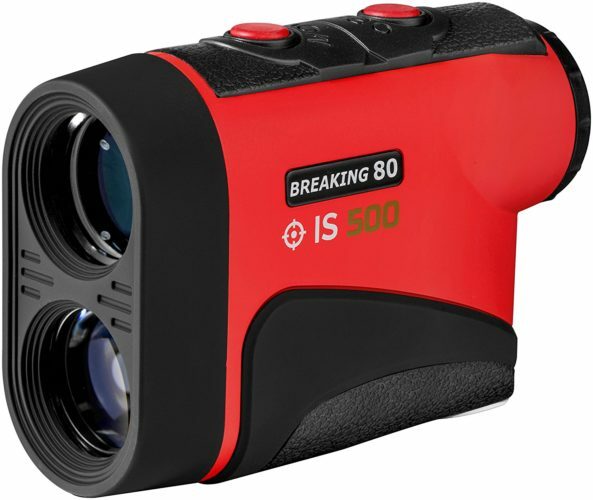 The IS500 is a high-quality golf laser rangefinder that comes at a very pocket-friendly price. It comes with a multilayer-coated monocular lens that provides up to 6x magnification, allowing you to get precise measurements in a range of between 5 and 550 yards, with +/-1 yard accuracy. The IS500 has a dual mode, giving you the choice between flag seeking technology and the 8-second continuous scan mode. The device is equipped with IntelliScan technology, which can be used in continuous scan mode to easily give distances to the bunkers, trees, the fairway edge or even the back of the green. The flag seeking mode is built with first target priority, which allows the device to quickly and automatically detect the flag while ignoring background targets. This can help you locate the flag even when you cannot see it with your naked eye. The body of IS500 is wide, measuring 4 by 1.4 by 2.9 inches. This makes it great for golfers who prefer a fuller feel when using a rangefinder. We thought the widebody would make it uncomfortable to hold and heavy. However, this is not the case. Despite the wide body, the IS500 is still portable and can be carried in your pocket. For those who like devices that match their style, the IS500 is available in four color schemes to suit your preferences. The device is also water resistant, which allows for usage in inclement weather. However, do not submerge it in water as it is not totally waterproof. For ease of operation, the rangefinder comes with two buttons located at the top of the device. These two buttons control all its functionality. To ensure that users have a tight grip when using the IS500, it is fitted with textured rubber on the bottom and top sides where it comes into contact with the hand. It also has a wide focus ring which makes it possible and easy to focus using one finger. The Breaking 80 IS500 gives you the freedom to choose between two scanning modes. You can decide to either use the eight-second continuous scanning mode or the flag seeking mode. The flag seeking modes uses First Target Priority technology combined with 3rd generation pin sensor technology. In pin seeker mode, the rangefinder can easily detect the flag while ignoring any objects that might be in the background. This mode is helpful for detecting the flag even in situations where you cannot see it with your naked eye. For instance, you can use it to measure the yardage to flags that are close to trees or bushes. The continuous scanning mode in the IS500 is equipped with IntelliScan technology, which enhances detection. This mode is particularly useful when you want a quick measure of the distances to several targets. In the continuous scanning mode, you can move the device across the course for a duration of 8 seconds. As you move your line of sight across the golf course, the rangefinder will give you instant distances to the back of the green, bunkers, water hazards, the fairway edge, and trees. Another thing we liked about the Breaking 80 IS500 is the ease of use. The rangefinder is very intuitive. You can easily use it for the first time even without perusing through the user manual. The buttons are properly labeled and are well positioned in such a way that use the device with one hand. The gadget comes with a user guide to help you understand the function of each button and how to use them. The IS500 is equipped with a 6X magnification, 24-millimeter multilayer coated monocular lens. Accuracy and range are quite high on this rangefinder. The IS500 can measure distances of up to 550 yards to the flag, with an accuracy of plus or minus one yard. The rangefinder is also fitted with an excellent LCD screen which makes it possible to read the measurements clearly even under the glare of the sun. The lack of a slope functionality makes the IS500 legal for use in any golf tournament. It is powered by a 3-volt CR2 battery and comes with a free carrying case and a no-questions-asked lifetime warranty. Precision Pro is another newcomer when it comes to the manufacture of golf measuring devices. After the success of their first rangefinder, the Nexus, they have followed up with two new rangefinders to replace the Nexus – the NX7 and the NX7 Pro. The NX7 Pro is the superior of the two. The difference between the two is the availability of slope functionality on the NX7 Pro. It can simply be described as a first tier rangefinder that comes at the price of a third tier rangefinder. The Precision Pro Golf NX7 Laser Rangefinder is among the cheapest you will find that offers such an advanced set of features. Given the very affordable price of the NX7 Pro, it is natural that some golfers might have some doubts about the overall design and build of this rangefinder. We also had some doubts until we got our hands on one. However, you will immediately notice that the device is well built. It has an elegant design that is not too compact, but at the same time, it is not overly cumbersome. We can say that Precision Pro managed the right balance between compactness and comfort. The device fits naturally in the hands. The device is 25% smaller than its predecessor and weighs only 5.4 ounces. Like you might expect with a modern rangefinder, the Precision Pro Golf NX7 Laser Rangefinder is very user-friendly. You simply need to press the power button to turn on the device, aim it at your target and press the power button again to get a reading of the distance to your target. It also has a mode button that is used for switching the slope functionality on and off as well as toggling the display between yards and meters. It has a black and lime green color scheme that makes it stand out. The lime green accents are kept to a minimum to ensure that it doesn’t end up looking like a cheap model. It comes with a premium carrying case that has the same color scheme. The eyepiece has an adjustable focus, while the display shows readings in a black text that is well organized and can be read easily. While you can switch between the slope and standard modes, it does not have anything to show other players that you are not using slope mode. The rangefinder is still tournament legal since the repealing of rule 14-3 allows slope edition devices to be used in tournaments as long as the functionality is switched off. Despite its small size, the Precision Pro Golf NX7 Laser Rangefinder maintains its accuracy. It is capable of measuring distances of objects that are up to 400 yards out with an accuracy of up to one-tenth of a yard. This is by far the most accurate device in this list. Actually, the extra accuracy doesn’t really translate into better shots since only a few players are capable of adjusting their shot to compensate for a tenth of a yard from 400 yards out. On top of that, the NX7 Pro also comes with Pulse Vibration Technology, which gives tactile feedback when the device locks onto the flag. It is also equipped with Target Acquisition Technology which ensures that you are getting the distance to your actual target and not any distractions which might be behind your target. It is also capable of up to 6X magnification. 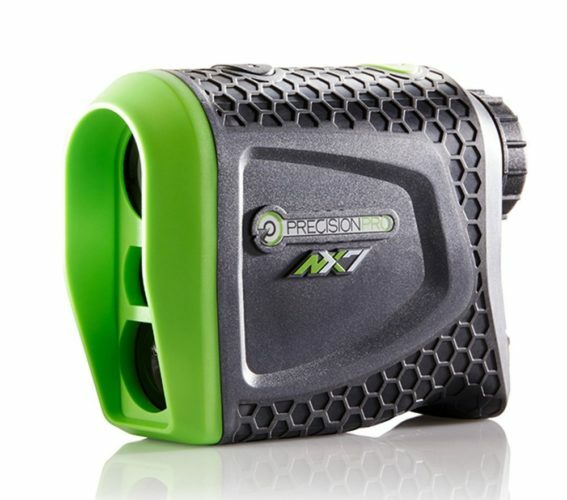 When it comes to value, the Precision Pro Golf NX7 Laser Rangefinder is the undisputed king. It is a reliable and consistent device that offers the same set of features that you will find on rangefinders that cost twice as much. On top of this, you get free batteries for life and a two-year warranty. Who else can beat this? 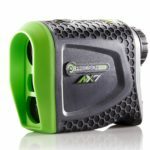 If you are not afraid of investing in a device from a newcomer to the scene, then the Precision Pro Golf NX7 Laser Rangefinder is a great choice. Before making the choice on the best rangefinder for your needs, you should make a point of checking the features on your preferred models. These include things like range and accuracy, shape, size and weight, magnification, brand, and technology. Ideally, you want a rangefinder with a long range, a high accuracy level, and high magnification. The shape, size, and weight will affect how you use the device, so it is important to find one that feels comfortable to you. You should go for rangefinders with all the whistles and bells, such as pin seeker technology and multilayered, high-quality optics. It is almost impossible to find a rangefinder that is fully accurate. Level of accuracy is determined by the error margin in a rangefinder. Accuracy ranges from half a yard to a couple of yards. If you find a rangefinder with more than 3 yards of accuracy, you should avoid purchasing it. You will need to decide whether or not you need the slope function in a rangefinder. The slope function is used to measure any elevation change between you and your target. Slope also estimates actual distance to a target and the distance a shot will play. The feature is quite useful when you are training or practicing to play. Remember the feature is not allowed in competitions such as golf tournaments. If you plan on using a rangefinder during a tournament, make sure the slope function can be disabled or is not present in your rangefinder. 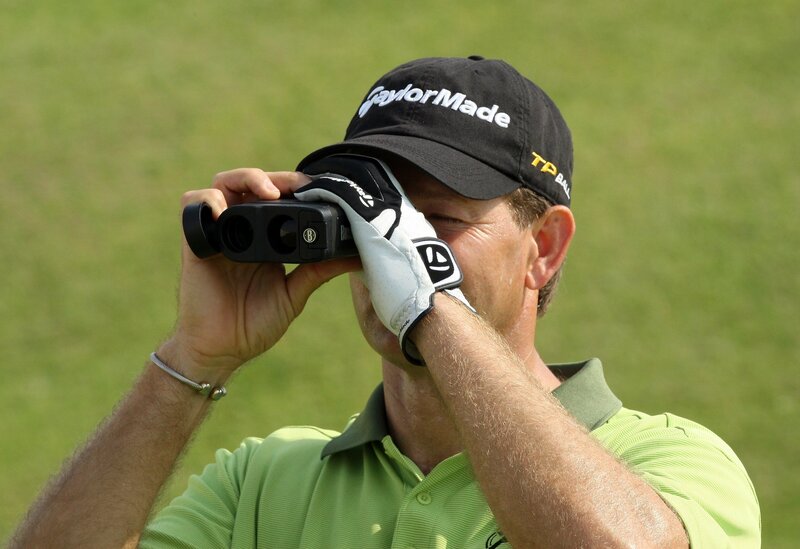 Golfers who have been using rangefinders are likely to use any current model available in the market. If you are an amateur or you have never used such a device you should strive to find one with the highest rating in ease of use. The most important factor when using a rangefinder is getting an accurate distance of the right target. A complicated to use rangefinder is not helpful as it will not help you find the right distance effectively every time you use it. Usually, devices with a single button and small size are considered to be easier to use. Majority of rangefinder models today have the ability to separate background objects from forefront objects. It means the device will show you the closets object should you be aiming for a flag located behind trees in the course. The technology is designed to enable the device to effectively differentiate flags and pins from other objects on the green. Different manufacturers will have different names for this technology including first target priority, pinhunter, and pinseeker. When the closest target has been locked on the display, some models will give a visual cue, vibration or sound. Golf rangefinders will vary in magnification. Generally, the range is between zero magnification and 7X magnification. This feature is important as it will determine how easily you will be able to hit any target. Devices with high magnifications are easier to use as they are able to hit a target faster and more effectively. Choose a rangefinder with the highest magnification to ensure you can use the device easily and effectively. Handling of a rangefinder is determined by its size. You may find you need two hands to keep the device steady. If this is the case then you need to get a rangefinder that is not too small. As a general rule, two hands will always make ranging easier. There are a number of models available that are wide enough to fit two hands. Take note that a large rangefinder is likely to be heavier. Make sure you balance the size with weight to get the best fit for your needs. Scan mode is available in most models. It allows you to get the distance of targets you are ranging. The mode is normally activated by pressing a button and waiting for a few seconds or holding down a button for a few seconds. It is a feature that is important in finding the right target among a number of targets. For example, if you want to get a flag next to trees, scan mode will make it easier to get the range. This refers to the ability to get readings clearly on your screen irrespective of the weather conditions. The best rangefinder would be one with units in red numbers. This will allow you to see the numbers in glaring sun or rainy weather. Usually, the cost of such gadgets are marginally higher. The price of the rangefinder is a major decision point for most people. After all, all buyers want to get value for their money. The variations in the cost of golf rangefinders are great. One of the reasons includes lack of trusted brands that sell rangefinders and their expert design. You can find a rangefinder with a low budget. The problem will be once you improve your game it may limit your chances of continually improving. If you are willing to buy a better one in the near future, you can get one at a low budget. If you have some skills in golf, you should invest in a high-quality brand as it will serve you for many years to come. A low-priced rangefinder will lack in quality and other very crucial features. This does not also mean good quality rangefinders cannot be found at cheaper prices. It only means that you are likely to find a great rangefinder if you do not mind spending a little more. Finally, you should consider whether it has slope compensation. In addition to distance, slope edition rangefinders allow you to measure altitude and climatic conditions. However, it’s important to note that slope mode is not allowed in tournaments, so if you are a professional player, you should find a tournament edition or one that has the slope-switch technology.